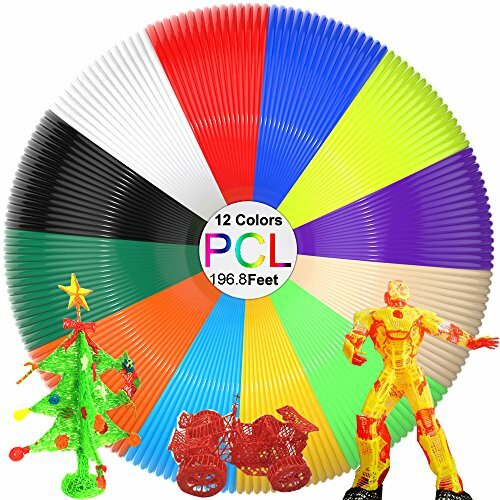 1.WHAT IS PCL MATERIAL : PCL is a 100% environmental material .This PCL filament refills is a type of plastic made from Corn that is biodegradable and free of petrochemicals! No gimmicks,non-toxic, no smell, safe for kids. 2.PACKAGING INFORMATION : 12 unique Colors ,16.4 Feet Each Color,196.8 feet 1.75mm PCL Filament Pack for 3D Printing Pens.A great gift for kids to try DIY what they want and bring up kids to have fun with crafting and drawing. 3.LOW-TEMPERATURE & RECYCLABLE FILAMENTS : PCL Filament is tested in 14.1°C, far lower than ABS or PLA.And this 3D pen PCL filaments refills can be recyclable if you are not satisfied with your masterpiece. Shape the used filament as you wish just soaking it into warm water for several seconds. 4.3D PRINTING FILAMENT FOR ADULTS : No matter what festivals such as birthday or Christmas, use the Printing Filament to design a gift for your friends and lovers is very meaningful. 5.100% MONEY BACK GUARANTEE : We have confidence to our product Please feel free to contact us via us if you have any question .We guarantee 30 days returned and money back. 2.PACKAGING INFORMATION : 12 unique Colors ,16.4 Feet Each Color,196.8feet 1.75mm PCL Filament Pack for 3D Printing Pens.A great gift for kids to try DIY what they want and bring up kids to have fun with crafting and drawing. If you have any questions about this product by Myuilor, contact us by completing and submitting the form below. If you are looking for a specif part number, please include it with your message.